Cycle Fun Montreal: Remember... the Mont Royal Beltway project? Blue and yellow traces are the new beltway, red is the long-existing Olmstead drive. The website Coolopolis reports that work is underway for the Mont Royal Green Beltway project. This will be an olmstead-road type path on the northern and western part of the main Mont Royal massif (i.e. not westmount). We are keenly looking forward to the 2011 opening of this new trail. 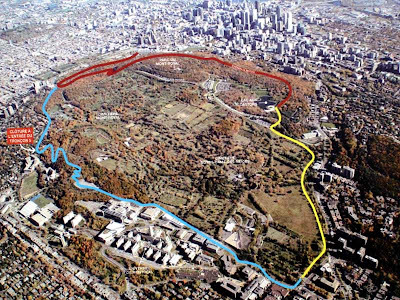 For some Mont Royal info, here is Les Amis de la Montagne's new Mont Royal interactive map.